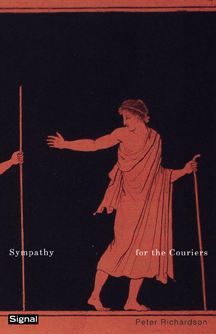 Sympathy for the Couriers is a collection of messages from the border region of our lives-that vast allegorized territory of cheap self-deceptions and illusions. By turns comical and grim, these new poems feature Peter Richardson at his most ventriloquistic. The "couriers" in question are the banged-up, long-suffering, Dantesque voices who, speaking through the poet, deliver their news: heartfelt, often heartbreaking admissions that, nonetheless, are always buoyant with aphoristic brio and panache. But the most important messenger here is Richardson himself, who having establishing a reputation as one Canada's best poets, has given us his most challenging book. Peter Richardson's poems have appeared in many Canadian and American publications. His first book, A Tinkers' Picnic [Signal Editions/Véhicule], was nominated for the Gerald Lampert Award in 1999. For over twenty-four years Peter Richardson has been employed as an airport ramp worker, first at Mirabel, and then Dorval. He lives in Montreal. 90 pp 8.5" x 5.5"